Last edited by Simply Red; 09-04-2011 at 01:57 PM.. This historic photo (date unknown) shows the Kansas City Municipal farm buildings and orchard. Soon thee site will be the home of a 100,000 square-foot hydroponic greenhouse Courtesy Kansas City Publlc Library- Missouri Valley Special Collectiions. This historic photo (date unknown) shows the Kansas City Municipal farm buildings and orchard. Soon the site will be the home of a 100,000 square-foot hydroponic greenhouse. Courtesy Kansas City Public Library- Missouri Valley Special Collections. Agriculture is coming to the Kansas City Municipal Farm site in a big way, officials said Tuesday. The former city jail site will be the new home of a 100,000 square-foot hydroponic greenhouse that was to go in Riverfront Park. BrightFarms, the greenhouse operator, and the city will soon announce the deal, Kimiko Black Gilmore, assistant city manager, reported to the mayor and city manager. The previous deal to do the $4 million greenhouse by the river fell through, she said. Also, the non-profit Boys Grow has leased 10 acres at the farm from the city. The group that teaches city youth about agriculture, marketing and sales is still planning how to use the land, said John Gordon Jr., founder of Boys Grow. One concept is to put goats there and produce goat milk and goat cheese, he said Tuesday. They may also set up an education center on wetland property there, he said. It would be in addition to the farm property and operation at their South Kansas City headquarters. About a fourth of the 20 to 28 youths in the program each year are from Midtown, he said. They will not grow anything on the municipal farm property this year, Gordon said, but will instead build up the soil. The BrightFarms site will be on the other side of 435 Highway, where the dilapidated old jail remains. The giant greenhouse will produce a million pounds of tomatoes, lettuce and herbs a year, officials said when it was announced for the Riverfront. The greenhouse, expected to produce enough vegetables to feed 5,000 people a year, was to create 25 full-time jobs. Does anybody remember the abandoned amusement park called Fairlyland? I remember seeing that place when I was a kid when the folks would take us to Smokestack for BBQ. I don't - sounds awesome though. Where was it, roughly? I went as a kid to Fairyland Park my Dad loved those places. He took us there once every summer till it started to run down. It had one of the great wooden roller coasters The Wild Cat and the best corndogs I ever ate. Better than the State Fair in Missouri and Iowa we always went to. It was at about 75th and Prospect Ave. It closed in the late 70's. I remember going there once as a child. There was also a twin drive-in theater nearby there. One side showed adult films. Mom says she remembers Fairyland - her dad apparently got sick on beer there - they had a all you can drink beer fest sort of thing - with food and everything. That'd never fly today in a kid-friendly environment. Not so pronounced, anyway. Same with adult films on giant drive-in screens, I suppose. I don't want to do the math on how long ago that was. 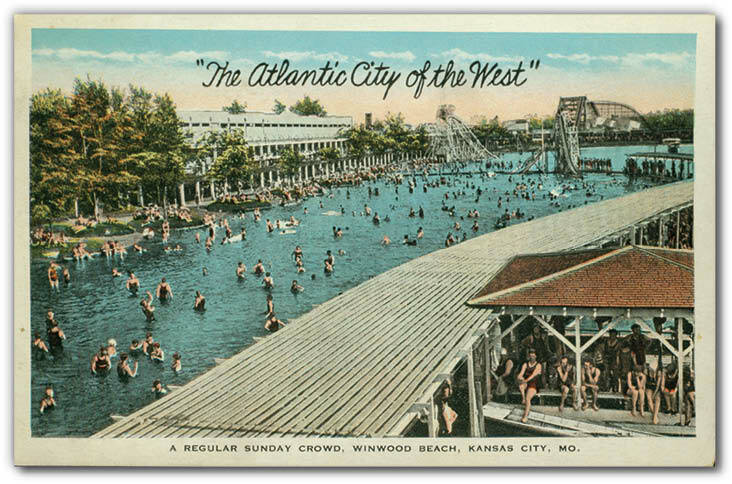 Did any of you swim at Winwood Beach in KC Northland? They called it the Atlantic City of the west lol. It was right across I-35 where I grew up. We went a few times but mom said it was to dirty and we swam at NKC public pool instead. Over time it dilapidated even more with the damn leaking and causing problems. The lake was drained and now its Chouteau Crossing shopping center. That's the perfect gate for stopping a 95 year old, blind man on a scooter. There's a winery in one of the buildings that is open to the public. 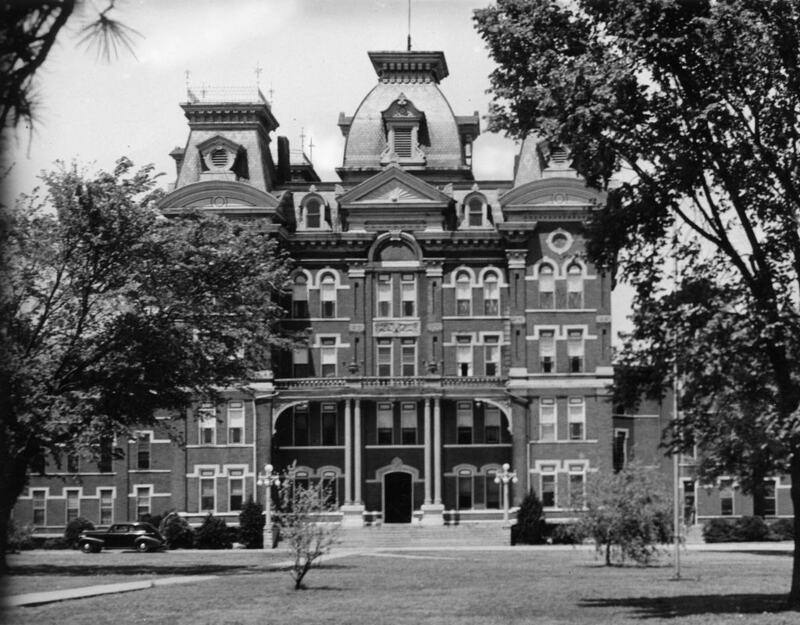 MO had numbered State Hospitals until they were defunded in the 1980s. There was one in Nevada, MO, which has since been torn down. They used to make us go sing for them when I was a kid. Scarred for life. Wow! Look at the architecture on that, it's beautiful. Shame that they tore it down. The inside looked like a 16th century castle.